If you aren’t familiar with how Greenlight works, people vote for games to appear on the Steam service. (There are no downvotes, only upvotes.) Games with enough votes will eventually be able to appear on the service for sale. Three games by IF luminaries have just appeared. If you care about the success of interactive fiction, please vote! This is going to sound like a bizarre statement to anyone who has played a Scott Adams game, but Adventureland is the first game in my chronological series that has felt modern. To anyone scratching their head, some clarification is needed. While yes, the game is simply an excuse to collect Treasures and put them in the right location and get a high score, and yes, the text is absurdly minimalist, everything is also compact. The adventures I’ve played so far have a certain expansiveness to them (see Zork: Open spaces, painful geography) with a giant map and a lot of confusion. While I’ve appreciated this style with space lending to world-immersion, I’ve also missed the feeling of small set-pieces that come from, say, a tightly structured IFComp game. Cypress tree. Evil smelling mud. Swamp gas. Patches of “OILY” slime. Chiggers. The evil smelling mud can be used to cure bites from the chiggers (which are themselves useful in a different puzzle). The mud also will wake up a sleeping dragon (found just to the north) if you bring next to him. The swamp gas has a property useful in a puzzle, and the “OILY” slime I have not actually figured out yet. Spider web with writing on it. Ring of skeleton keys. Old fashioned brass lamp. Water in bottle. Sign “Leaves *TREASURES* here, then say: SCORE”. While the text might only be appreciated now as a sort of anti-poetry, the tight implementation gives the locations in my mind a stronger imaginative force than the hundreds of rooms of Acheton. I’m about 3 hours in — I supposedly have 70% of the treasure — and having reasonable fun. Likely the last 30% will get me stuck. Perhaps the last lingering puzzles will be hideous; it’s hard to know. 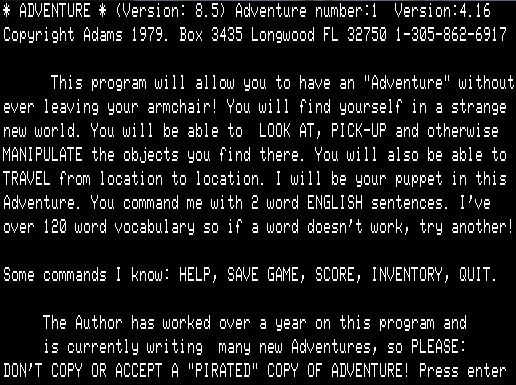 Adventureland nearly has the distinction of being the first text adventure available for home computers. It is slightly edged out by a port for the Heathkit H8 of Adventure which debuted in August by Gordon Letwin (who later went on to make the port Microsoft Adventure) and started being sold in Issue 4 of the magazine REMark (fourth quarter of 1978). However, Adventureland is the first one made specifically for home computers; specifically, the TRS-80. It started being sold January 1979 through an ad in Softside magazine. Scott Adams himself says it was the first venue in a video interview. He mentions testers which presumably tried the game in 1978, but with commerical products it is standard practice to date them by when they first are commercially available. Every other source out there says 1978 including the thoroughly well-researched Digital Antiquarian. although it should be noted that this is a later revision of the game and it is possible an early title screen said “1978” since that is undoubtedly when the coding of the game occurred. 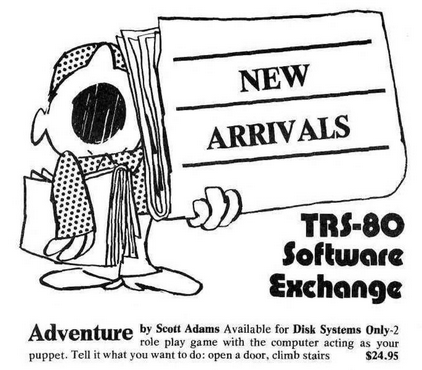 Scott Adams’s adventures all used a particular data format which can be run with the interpreter ScottFree. For at least Adventureland I’m going for the classic experience with a TRS-80 emulator, although there are plenty of more modern options available. I’ve been having more fun than The Digital Antiquarian did (I’ve avoided reading his article too closely because it looks like it has spoilers, but I caught the quote “Which is not to say that Adventureland is exactly playable, at least by modern standards.”) I’ll get into gameplay details next time. I’ve discussed how Acheton has many, many, ways to die. This is not unusual in an adventure game. What *is* unusual is that in order to get all the treasures you need to die once. Spoilers for this and the endgame follow. You are in a bare room with exits off in all directions. On the ground is a heavy stone slab bearing the words ‘Abandon hope all ye who enter here – ANON’. You fell into a pit and broke every bone in your body. I first essentially interpreted this as an out-of-game question, just like a RESTORE/UNDO/QUIT menu. You are in Hades. The place is lit by the eerie glow of fire and brimstone. The souls of the dead walk with heads hung and gloomy faces, trying to perform impossible tasks. The sound of demonic laughter echoes around, sending shivers down the spine. Anne Boleyn wanders past with her head under her arm. There is a loud clatter as a party of Hell’s Angels rides past in fiery chariots. There is a beautiful crystal skull on the ground near you! On the unfair-o-meter, I didn’t find this Ludicrous once I found there was a treasure in the afterlife, but I needed hints to figure out how to get out. The random Dante reference in one room did not translate in my brain to an escape via magic word. (Incidentally, DANTE works also as the magic word.) The main difficulty was discovering the whole section exists in the first place, since for the longest time I immediately restore my game upon dying. I’ve been harping on unfair parts in Acheton, but there is a saving grace: you don’t need every treasure to win. You won’t get a full score, certainly, but “finished and filling in missing points” has a different feel than the brick wall of being stuck in the middle. As you close the safe, the ground shakes slightly and a large slab of rock detaches itself from the ceiling, just missing you as it falls, and blocks the stairs. WELL DONE!! YOU ARE NOW FULLY QUALIFIED TO ENTER THE MASTERS’ SECTION. I tested all the way down to forty-five treasures and still was able to enter the endgame. Omitting ten treasures is enough to skip most of the heavily obscure sections. You are in a high, circular room with highly polished walls which sparkle and shimmer in all colours of the rainbow. Lighted passages lead off to the north and to the south. The room itself is lit by chandeliers hanging from the ceiling. There is a large basalt disc here. There is a very large granite disc here. To be fair, you don’t have to solve the whole thing; just move enough discs around to clear a hole that you enter for the final arena. A hissing vampire with large blood-stained protruding canines. A vial of poisonous gas. Which weapon would you like? The rest of the game involves matching the right weapon to the right creature. This could nearly be considered choice-game mode — you can’t move around or do anything other than type weapon names — but there’s one last trick. A black knight on a black charger. The black knight charges into the arena, his lance pointing straight at you. At the last moment you jump to one side. He attempts to swerve, and in doing so becomes unseated and breaks his neck on landing. The crowd seems uncertain whether to cheer or not. AXE works, but this is the only way to get the last 3 points of the game. You throw the keg of gunpowder at the dragon, which is quietly blowing smoke rings at the time. A stray spark ignites the gunpowder and blasts the dragon into little bits. The crowd rise to congratulate you, master gladiator. You leave the arena, to the applause of the crowd, and receive your laurel wreath. You have scored 1500 points out of a maximum of 1500. You are now a Grandmaster Supreme of Acheton, and have been elected to the Ruling Council. Please communicate with the relevant authorities to claim your seat. Do you want another game? 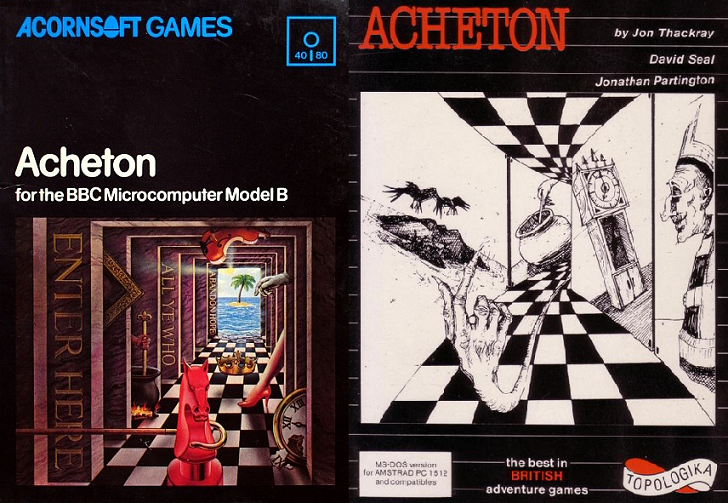 Covers from Museum of Computer Adventure Games and Moby Games. Before I sign out, I should point out the commercial versions (covers above) are slightly different than the mainframe version I played. Primarily, the weapons that were just there in the arena are spread out through the whole game, and have to be brought to the endgame to get a complete resolution. While collecting the weapons makes the arena at the end seem less like an arbitrary surprise, there’s so many finicky things to worry about in Acheton I’d rather do without. Consequently I’d recommend the mainframe version (Acheton.z8 from here) for anyone that wants to give the game a try. I’d think it’s still worth trying if you don’t go for a full score so you can skip the more obnoxious parts. 1.) Acheton has multiple “cruel” bits were you can unknowingly break the game and not find out until many hundreds of moves later. 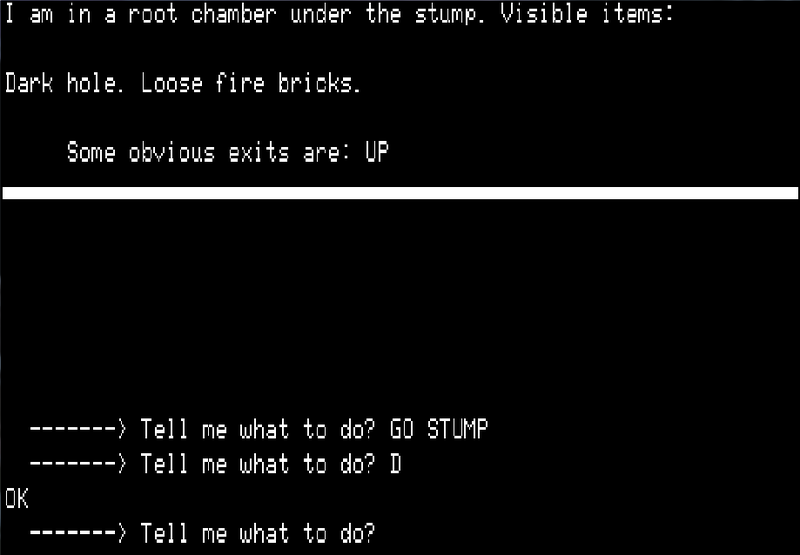 Zork had a few points like that but it was obvious when it happened right away. You could lose a treasure in Adventure via the bridge, but it was essentially intentional on the player’s part and an acceptable puzzle to force the player to plan a way of getting their treasure back. 2.) Without light most of Acheton is unexplorable. Acheton’s lamp timer is very tight, and there’s just no chance for “noodling around”. Adventure had a relatively generous time limit, and Zork went one better with an unlimited light source. A fearsome looking stone idol glares at you malevolently with its single green eye from the opposite end of the room. You wrench the eye of the idol from its socket. As you do so, the idol starts to glow faintly and emits a hollow groan. It then grabs at you, but fortunately you jump back just in time. The idol then blunders around the room searching for you for a few minutes, and you have a number of narrow escapes before it appears to give up. It then sits down in the lotus position, and then gradually fades away from view. After taking the eye, the idol has a random chance of showing up and killing you the rest of the game. Not only is this far less interesting than intermittent battles with dwarves or the thief, the best strategy is to save taking the eye as the very last treasure, nullifying having the enemy at all. As I was preparing this, Emily Short made a massive post which seemed to cover every text game event ever. This is just 2015, roughly in chronological order. If you want more detail, a lot of the events mentioned here are mentioned there as well, complete with organizer commentary. While this list has mostly competitions, it’s not intended to be exclusively about them. Anyone who intends a Kickstarter, conference, public reading, etc. is welcome to let me know and I can add it to the list. This competition for interactive fiction in French goes from January to February. ParserComp 2015 is a ranked, long-form game jam for parser games (also sometimes called text adventures). a multimedia text adventure called “Imagine a World.” It’s a prequel to the world of Glitch, an MMO by Tiny Speck that shut down a few years ago. The sequel to Shufflecomp will be announced in Feburary. You sign up by sending me a list of eight songs that you think might make for good games. I shuffle them up, and send each participant eight songs. They pick one and make a game vaguely inspired by it. I might not normally include this is a “text game event”, but there are a large number of text games in contention for the IGF Awards, including the majority of the “Excellence in Narrative” category. The IGF Awards take place on the evening of the third day of Game Developers Conference, and are a major celebration of the best in indie gaming, with thousands watching the award presentation before the Game Developer’s Choice Awards are presented. The 2014 IGF Awards, including custom interstitials from Mega64 and Hey Ash Whatcha Playin’?, are available for online viewing. The Festival Awards will take place March 4, 2015. This competition of is for short works (90 minutes or less). Both parser and choice interface works are allowed. March 1, 2015 12 p.m. CET: Deadline for submission of intents. April 1, 2015 7 p.m. CET: Deadline for entries. April 1, 2015 12 p.m. CET: Entries will be released to the public. May 1, 2015 11.45 p.m. CET: Voting deadline. May 2, 2015: Results will be published. Formerly a “competition” for interactive fiction, the rebranding as a “festival” indicates a new focus on showcasing and promoting new games in a friendly, less competitive environment. March 1, 2015: Deadline for authors’ intents to enter. April 1, 2015: Deadline for games to be submitted. April 4, 2015: Festival opens. May 4, 2015: Festival closes; ribbons awarded and games archived. It is the intention of the Windhammer Prize to promote the gamebook genre, and in doing so deliver to readers new and original adventures that express the innovation and creativity that can be found in authors of interactive gamebook fiction today. In pursuit of this objective the Windhammer Prize values most those gamebook entries that expand the boundaries of the genre. If you believe you have an idea for a work of interactive fiction that is both original and innovative then this competition is definitely for you. Entries are accepted from August to the beginning of September; voting closes the end of October. The publication of winning entries is a commercial opportunity being offered by Tin Man Games that is available to First Prize and Merit Award winners. Publication will be offered as an idevice app that includes these three winners within the one 2014 compilation title. The Interactive Fiction Competition is an annual event begun by passionate hobbyists in 1995 to encourage both the creation and the discussion of new interactive fiction works (also known as IF). While the definition of IF has evolved in the years since then, the IFComp’s format and schedule have remained stable since the 1990s. Anyone can judge the entries on a one-to-ten scale, and the laurels go to the entries receiving the best average rating. Deadline for entries is near the end of September, while judging lasts until November. WordPlay is our free festival celebrating the most interesting uses of writing and words in contemporary games. Each year there will be a curated game showcase, talks by creators about the craft, and ways for the public to learn about making games. The festival occurs early November in Toronto. This competition for Russian interactive fiction goes from November to December. Please feel free to let me know about anything that should be added. Hot off their success of 80 Days inkle is gearing up to finish their third Sorcery! game. This one is big, complicated and different, and we think will up the ante on the kind of gameplay a text-driven choice-based game can achieve. Bramble House is the only home that fifteen-year-old Penny has ever known. Penny is bound in service to the witch Stregma, forced to deal with everything from mundane dishwashing to evicting monstrous guests. …create an entirely new category of interactive novel you can play on your tablet or phone. It will be visual, it will interactive, and it will allow the reader to decide where the story goes. Our goal is to empower everyone out there to tell their own stories, and unleash a new wave of games from people of colour, members of the GLBT community, people with disabilities. Our long-term goal is to replace Twine. Sunless Sea promises a release in February. Explore a vast underground ocean in your customised steamship! A PC & Mac game in glorious 2D, Sunless Sea is a game of exploration, survival and loneliness set in the award-winning Victorian Gothic universe of Fallen London. Take to the helm and set sail for the unknown. Light and darkness are your greatest allies, but a stout set of cannon and a gunnery officer with a grudge will come in useful too. Sol Invictus will be out for mobile devices Janurary 8th. For three years the soldiers of the Black Lance Legion have watched as the Invaders turned their solar system into a hellish, desolate wasteland. Humanity’s most advanced fighting force lurked in the shadows, doing little while their species was forced to choose between eternal enslavement… or extinction. The Hero of Kendrickstone, by Paul Wang, author of Mecha Ace. You are a young adventurer, seeking fame, glory, and a square meal. The Lost Heir. The start of a trilogy by @Lucid, author of Life of a Wizard and Life of a Mobster. Choice of the Petal Throne. Takes place in the world of Tékumel. Shadow Horror. The latest from Allen Gies. Killing Time: You are a high-priced assassin, traveling the world and killing people in far away places. Demon Lord of the Labyrinth. You are a demon lord, recently escaped to the Material Plane, trying to rehabilitate an old labyrinth. A Wise Use of Time, by Jim Dattilo, author of Zombie Exodus. An insurance executive, you awake one morning to find yourself possessed of the ability to command the flow of time. How did this happen, and what are you going to do with your new-found powers? MetaHuman, Inc., by Paul Gresty, author of The ORPHEUS Ruse. You’re a division head that suddenly becomes CEO of a huge multinational corporation that’s busy developing sorcery/cutting edge technology; you have to deal with typical corporate shenanigans (employee embezzlement, workplace romances gone sour) while trying to fend off the sinister “majority shareholders” and figure out what happened to the previous CEO. Champion of the Gods, by Jonathan Valuckas, author of the Fleet. You are a demigod, striving to make your way in a sword-and-sandal world. Hollywood Visionary, by Aaron Reed. You are a movie-maker in 1950s Hollywood, trying to craft your first feature. Versus, a new series by Zachary Sergi. A sci-fi yarn where you are on a prison planet, fighting to return home. Heroes Rise: The Hero Project: Redemption Season. A new game in the Heroes Rise world, with a new main character, where the player is a contestant in season two of The Hero Project. Ratings War. You are a journalist in a cyberpunk future. a story about gypsies, magic, death, life, and the Power of the Blood. a summer college campus where a group of gifted students gather. Aaron Reed and Jacob Garbe project an April release date for Ice-Bound: A Novel of Reconfiguration, played via either iPad or a computer with a web camera. Half of the Ice-Bound experience is an 80-page full color art book: the Ice-Bound Compendium. Filled with Holmquist’s personal files, unfinished chapters and alternate drafts, collages of research and strange, distorted transmissions, the book mingles Holmquist’s story with those of his creations. It isn’t clear where these images came from, but one thing is certain: KRIS desperately wants to see it. Interaction involves showing pages of the book to the artificial intelligence in the game. 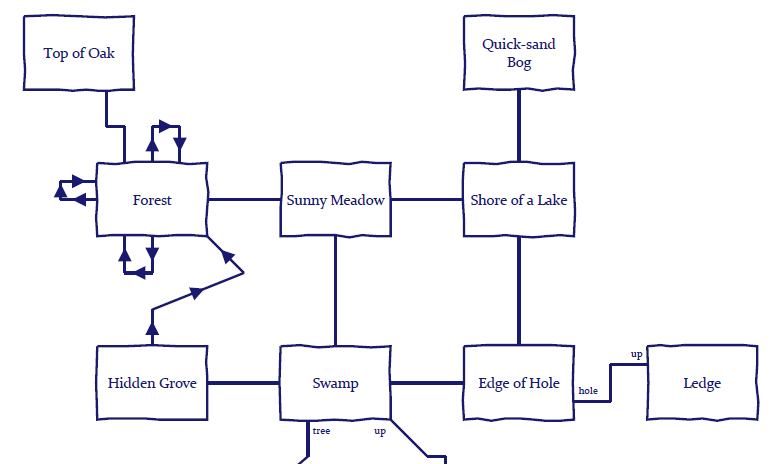 DestinyQuest is a web-based gamebook, based on the earlier paper-based version by Michael Ward. Act I is already available. Robb Sherwin’s Cyberganked mashes together The Bard’s Tale, text adventures, and a CGA aesthetic. Same location, but greatly elaborated. Similar plot premise. Lots of new characters. A few of the puzzles are related to those in the first game, but most are completely new. Sword Daughter, an adaptation of a gamebook from the 1980s, is currently in beta. All your life, you dream of adventure: knights, dragons, magic rings, chests of gold, and all the danger and glory that awaits a professional swordswoman. But every dream has a cost. You are on your way across the desert wastes to compete in the Warrior Games when your caravan is attacked. Orcs and bandits murder your father, capture your companions, and leave you for dead. Now alone in the world, will you choose to seek glory, vengeance, treasure… or love? Back in 1987 GAMES Magazine printed an article titled They Take the High-Tech Road to Adventure profiling the company Infocom. I remember as a child reading the article many (many) times and dreaming of working there. Because GAMES was (technically, still is) a puzzle magazine, they felt obligated to include a bonus; specifically, a transcript from Leather Goddesses of Phobos which included enough information to solve the puzzle from the game. This is not a puzzle genre that ever took off, but I did find a perfect moment in Acheton for an experiment. Read this transcript and figure out how to get past the large sheet of glass. There is a turquoise amulet here! There is a bunch of keys here. There is a lump of lead on the floor near you. There is a small box of matches nearby. There is a mink coat with bulging pockets lying in a heap nearby! There is a large glass palantir here! There are some magnificent quartz crystals on the ground here. There is a three foot black rod with a rusty star on the end nearby. There is a small pair of scissors here. There is a large old-fashioned mercury thermometer here. There is a pair of dull brass tongs here. There is a beautifully fashioned Stradivarius violin here! south. An icy breeze comes from the north. in from a passage to the north.